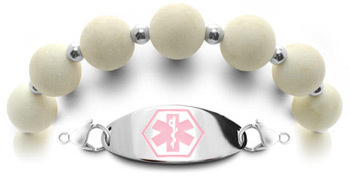 Let your medical alert bracelet speak for you. Wear an ID on your wrist because that's where paramedics look first. Anyone with these issues must consider wearing a medical bracelet. How long does it take to get an ID bracelet? Assuming that we contact you personally to confirm wrist sizes and get correct medical information, the order sould ship the next day. In general, we allow 2 weeks since these are all custom handmade bracelets. However, most orders, even when we can't contact you immediately, will go out much sooner. Inquire for rush orders. • It doesn't have to be ugly. See 600 ways to stay safe and fashionable. 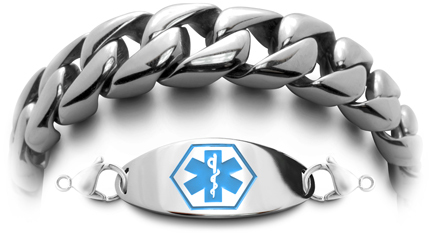 Should I always wear a medical alert bracelet? Sleeping, driving, shopping, swimming and showering: you never know when an emergency may happen. So it's always best to be prepared. And, most major medical organizations recommend wearing a medical ID at all times. Speak to your doctor for what medical information must be included. It's critical to get the right information for fast moving emergencies because it's your life. 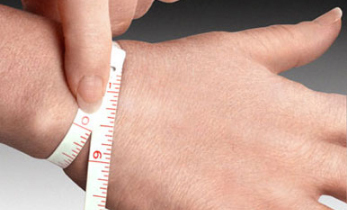 Proper fit depends on your exact skintight wrist size. All bracelets are checked on a professional mandrel—a scientifically accurate sizing system. DO NOT use an old bracelet as your guide because the length of a bracelet is determined by the material thickness of the beads and chain. Thick materials produce longer bracelets; thinner materials make it shorter. Choose custom sizing for comfort because you'll be wearing this 24/7. No matter which style you choose, all our bracelets fit correctly. Choosing an ugly bracelet that "looks medical" could be a disaster because buying a boring bracelet that you'll never wear is a waste of money, and is dangerous! Choose the right material: Stainless steel WaterWear Bracelets® for all-around wear in water and more rugged conditions. Gold and silver WaterWear Bracelets® for moderate conditions where corrosive chemicals are not present. And, fashion beaded bracelets for when special high fashion styling is desired—and where WaterWear Bracelets® are not required. Choose the fastest way to keep you safe when every second counts. Paramedics look to your wrists first. Second they look around your neck. Third they look to your ankles. Unproven technology: Not all technology is good for medical emergencies. USB bracelets are not reliable in the field where paramedics don't have time to load your data into a computer and wait for information. The same goes for QR bracelets that require special scanners and a reliable internet connection, and the time to upload your data. While a few areas of the country have this capability, 98% of America does not! Make sure you know this is working in your area.